The 29th College All-Star Game on August 3, 1962 featured the Green Bay Packers, NFL Champions of the previous season, facing a group of All-Stars under the direction of Otto Graham, who was back at the helm for the fifth consecutive year. Coached by Vince Lombardi, the Packers had the league’s most prolific scorer, HB Paul Hornung, plus FB Jim Taylor to fuel the running attack and QB Bart Starr (pictured at right) was an accurate passer, all operating behind an outstanding line. The defense was also strong from front to back and contained players coming off of All-Pro performances such as DT Henry Jordan, OLB Bill Forester, and CB Jesse Whittenton. 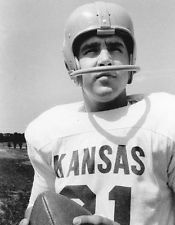 The All-Stars had future pro standouts on the roster that included QB John Hadl and HB Curtis McClinton of Kansas, QB Roman Gabriel from North Carolina State, HB Lance Alworth of Arkansas, and Utah State DT Merlin Olsen. However, they were missing two running backs due to illness: Baylor HB Ronnie Bull and, far more seriously, HB Ernie Davis, the Heisman Trophy winner from Syracuse, who was in the early stages of the leukemia that, tragically, would end his life the following year. There were 65,000 fans in attendance on a 79-degree Friday night at Chicago’s Soldier Field. The All-Stars took the opening kickoff and drove 80 yards in 13 plays with John Hadl behind center. Hadl, typically rolling out to take advantage of his mobility, completed all four of his passes along the way, including one that was partially deflected by DE Willie Davis but was still hauled in by Lance Alworth for a 22-yard gain. FB Earl Gros from LSU (who was also Green Bay’s first-round draft pick) dove into the end zone from a yard out on a third down play for a touchdown. Greg Mather of Navy added the extra point. CB Herb Adderley returned the ensuing kickoff 33 yards and the Packers responded with a 67-yard scoring series in seven plays, although hindered by two holding penalties. 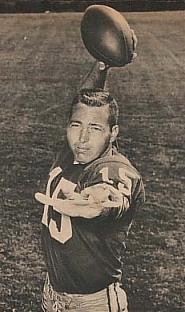 Bart Starr completed three passes to flanker Boyd Dowler, for 49, 26, and 22 yards, the last of which was good for a TD. Paul Hornung converted to tie the score at 7-7. That was it until midway through the second quarter when the All-Stars got a break on a turnover. 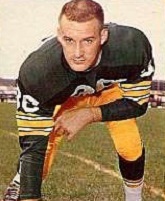 HB Lew Carpenter of the Packers fumbled a punt and Kentucky center Irv Goode recovered at the Green Bay 27. The turnover resulted in three running plays and a 26-yard Mather field goal that put that collegians back in front by 10-7. Once again it appeared that the Packers would respond with a score until Notre Dame CB Angelo Dabiero intercepted a Starr pass intended for split end Max McGee at the goal line and returned it 37 yards. However, any hopes the All-Stars had of adding to their lead were extinguished when LB Dan Currie picked off a sideline pass by Roman Gabriel and ran it back 31 yards to the All-Star 27. With less than a minute remaining in the first half, Starr connected with Dowler for 23 yards down the middle and then, rolling out to his right, fired a pass to TE Ron Kramer for a four-yard touchdown. Hornung added the PAT and the Packers were ahead by 14-10 at the half. Neither team had distinguished itself on the ground in the first thirty minutes of play, with Green Bay, known for its outstanding running game, gaining just 17 yards and the All-Stars, who had 104 yards through the air, being held to a net total of minus one yard. Once again the pro champs turned the ball over on a kick when Adderley fumbled the second half kickoff and Oregon State HB Hank Rivera recovered and returned it to the Green Bay 25. Following a run by Gros for three yards, Hadl threw to Ohio State end Charlie Bryant, who outmaneuvered SS John Symank for a 22-yard TD. With the successful Mather conversion, the All-Stars were once again in the lead by a 17-14 margin. The Packers came back with a 10-play, 67-yard drive. Starr hit Dowler (pictured at left) for a 22-yard touchdown and, with Hornung’s kick, Green Bay was back in front by 21-17. A personal foul helped the All-Stars along on their next possession that reached the Green Bay three before the defense held and Mather kicked a 14-yard field goal to make it a one-point contest. Up by just 21-20 heading into the fourth quarter, the Packers finally pulled away in the final period. It started on the second play of the quarter when Starr completed a five-play, 64-yard series with a touchdown pass to McGee from 20 yards out and Hornung booted the point after. Shortly thereafter, a 28-yard punt return by FS Willie Wood gave Green Bay the ball in All-Star territory and it took just two plays to score again. Starr passed to McGee along the sideline for a play that covered 35 yards for a TD. Hornung converted once again. The All-Stars had to turn the ball over on downs and, with their reserves in the game, the Packers advanced to one more score, going 44 yards in 10 plays. The drive was helped along by a roughing-the-kicker call on a McGee punt. HB Elijah Pitts, just returned from Army duty, capped the scoring with a three-yard carry around end with less than two minutes remaining in the contest. Hornung kicked his game-record sixth extra point and what had been a close game for three quarters resulted in a 42-20 win for the Packers. Green Bay led in total yards (380 to 237) and first downs (16 to 11). The Packers turned the ball over three times, to two suffered by the collegians. Bart Starr completed 13 of 22 passes for 255 years and his five touchdown passes set an All-Star Game record. John Hadl (pictured at right), who was named MVP for the All-Stars, completed 6 of 10 passes and averaged 48.8 yards on five punts. The win by the Packers gave the pro champs a lead of 19 to 8 in the series, with two ties, and it was the third for Green Bay. They went on to repeat as NFL Champions in 1962, going 13-1 to top the Western Conference and then defeating the Giants for the second straight year in the league title contest. John Hadl joined the San Diego Chargers of the American Football League and went on to a 16-year pro career, also spending time with the Rams, Packers, and Oilers and throwing for 33,503 yards and 244 touchdowns. He was selected to four AFL All-Star Games and two Pro Bowls.